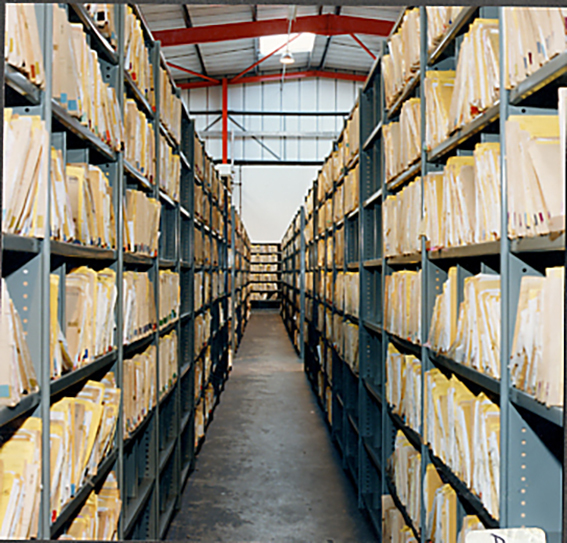 NSI provided rolled edge archive shelving system ideally suited for the customer. Aintree Hospital is a NHS Trust hospital in Liverpool which provides healthcare to around 330,000 people living in North Merseyside. Aintree Hospital is also a teaching hospital for students from the University of Liverpool and provides specialist treatment in Respiratory Medicine, Rheumatology, Maxillofacial and Liver Surgery. NSI recently supplied archive shelving to a ward with a need for temporary storage for medical records. The area was very restricted and it was determined that rolled edged shelving was best suited to the task. Rolled edged shelving has been used for file storage over countless years and has proven itself to be one of the most cost effective shelving systems available from NSI Projects. The installation has a 25mm pitch for finite adjustment and making the dense storage of files very suited to this shelving system, most files being stored on a 12”(305mm) pitch – enabling six levels of storage within a single bay 1905mm tall. 12” (305mm) or 18”(450mm) shelf depths are most commonly used. Dividers can help reduce the files leaning over too far in shelving which is not fully used, and this also forms pigeon hole compartments which can be used for sorting files into classification of use. The rolled edged shelving system can also be used as mobile storage, which uses much less floor space to enable up to 1/3rd additional storage. For further details about industrial shelving Liverpool, contact NSI.